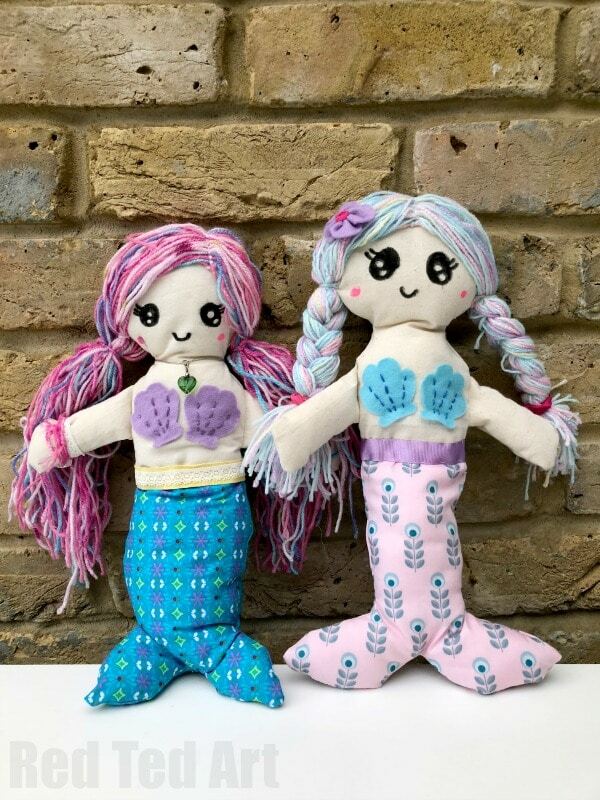 Earlier this year we shared a rather GORGEOUS Free Mermaid Doll Croch Pattern. 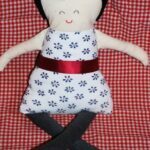 Today, we share a very simple Free Mermaid Rag Doll Pattern. 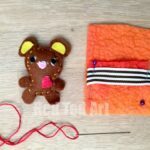 It is a pattern that I sewed with my 8yrs old.. and as you can see from our images below – one pattern can easily result in completely different looking dolls (depending a little on the child’s sewing skills)… but it is a perfect Rag Doll Pattern for beginners to have a go and enjoy. 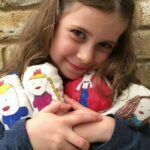 My daughter is so so so pleased with the result and hasn’t let go of her Mermaid Dolls since. 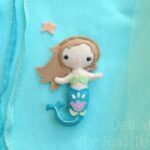 I hope you like our Free Doll Pattern as much as we do and have a go at making your very own DIY Mermaid Dolls! 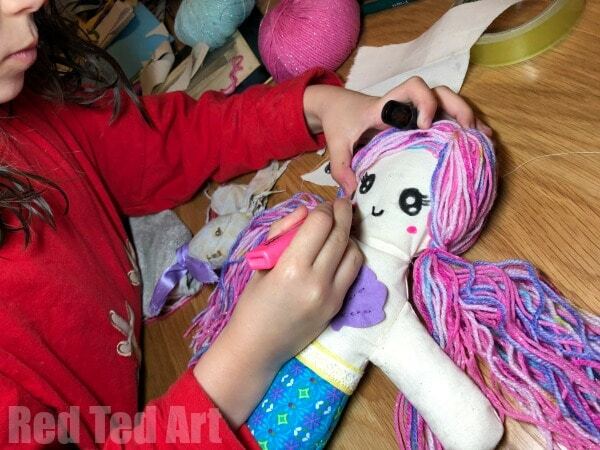 Lots more Mermaid Craft Ideas for you on Red Ted Art! Please note: this is very much a “together project”… though my daughter at 8yrs is keen and surprisingly competent, I did have to help a lot. I will indicate which bit she created! 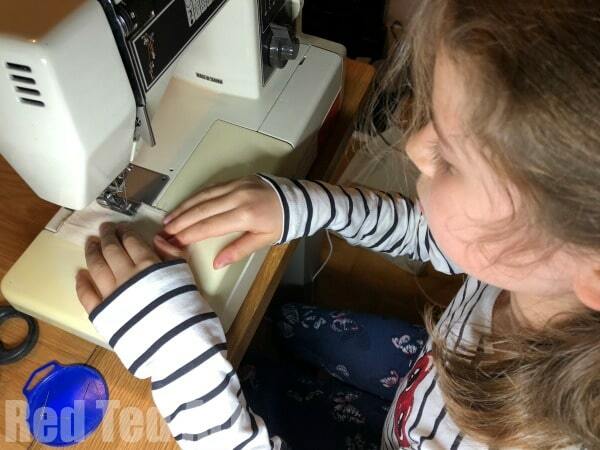 We haev some great tips for Teaching Kids to Sew and many more fantasic Kids’ Sewing Projects for you to browse! Begin by gathering your supplies! For us this included a trip to the local Sewing Shop. It is good to support local businesses and there is nothing quite like selecting (and feeling) your own fabric. 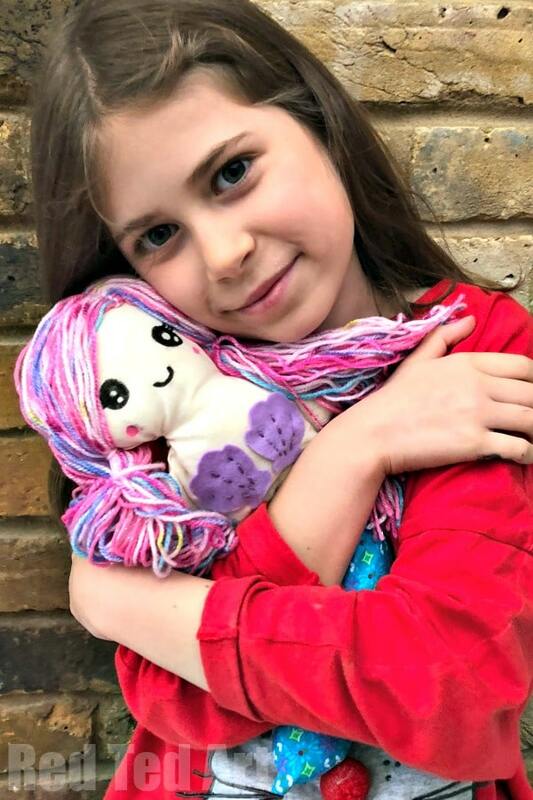 Pip Squeak found the fabrics we used for the mermaid tail as well as some fantastic rainbow wool for hair! 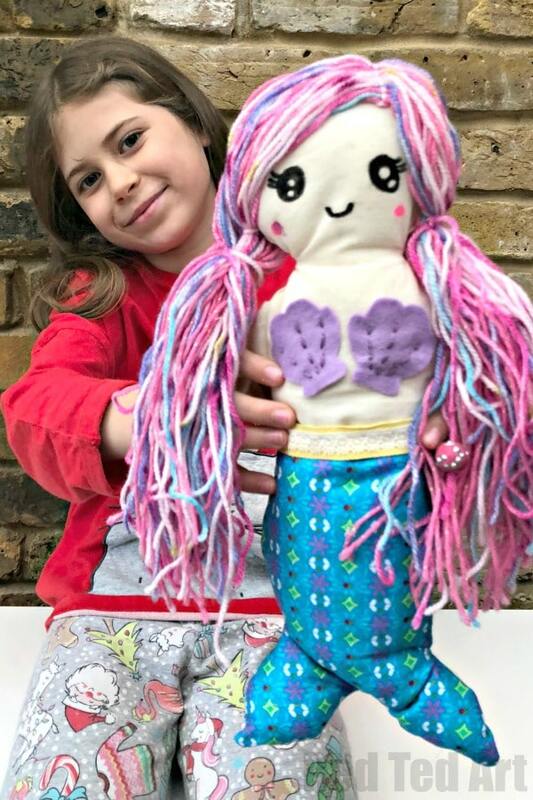 Watch my Rad Doll Mermaid Video (filmed with my daughter) or follow the step by step sewing instructions below! I pinned the arms for my daughter to sew. I also pinned one body part to one tail part. Remember, when folded the “right side” is on the inside. 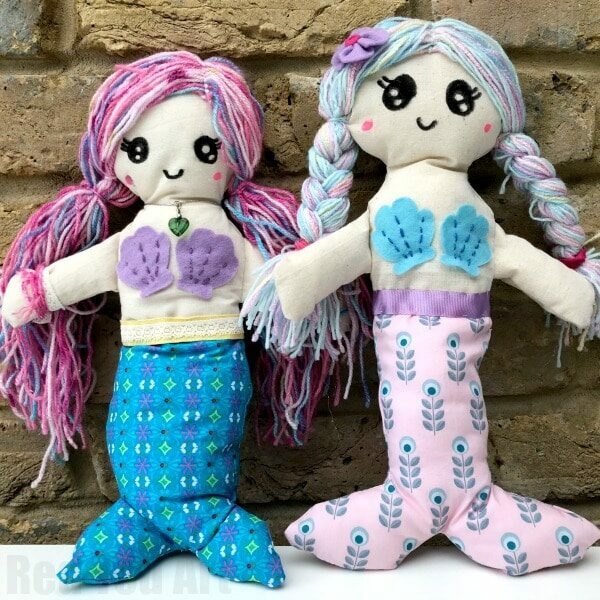 You can choose to assemble your mermaid rag doll differently – and sew your body and tails separately and then connect. We decided to connect the pieces first and then sew them as one. Sew your arms and midriff. Pip Squeak sewed the arms herself – with guidance from me – especially when going around the “curve” of the arm. I sewed the midriff as I needed this to be as straight and accurate as possible s0 both body sides still fit together! I snipped the “corners” of your arms, so that when you turn them, you have a neater finish and the fabric doesn’t pull. Pip Squeak, turned and stuffed. Place one body piece right side up on the table. Place one arm across it – with the arm opening on the top right shoulder. And the end of the arm pointing down. Place the second arm with the opening on top left shoulder pointing down. The arms should be crossing. Now place the second body piece, right side DOWN on top. Carefully pin in place. Leaving an opening on the right hand side of the mermaid’s tail. Be sure that the arm produce by at least 0.75cm. If it is too little, there is chance you may not sew “in” properly. 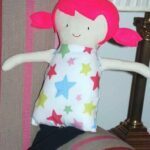 I started Pip Squeak off, by sewing over the arm joint (a bit bulky and difficult). She then sewed around the head (again with guideance to help her turn the fabric as she went) and when she got to the second arm, I sewed that again for her. She then continued to sew down the side of the mermaid and all around the tail. Again, I stayed close to hand, to help her keep her margins ok and learn how to turn corners (e.g. on the point part of the mermaid’s tail). 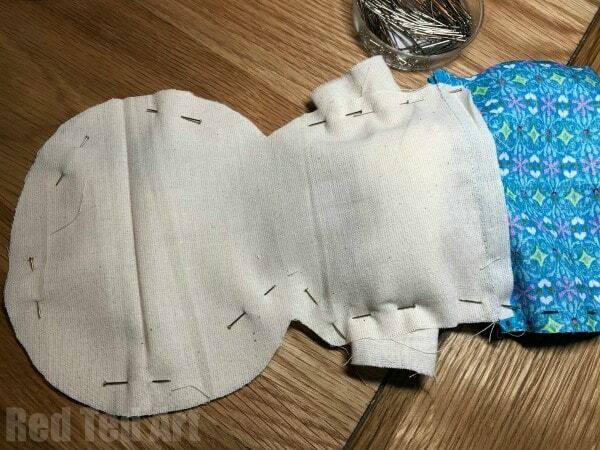 Once sewed, we snipped the round parts and the corner parts of the mermaid – in order to help with the turning of the fabric. 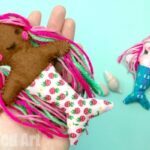 Time to turn your mermaid rag doll right away round. We eased the arms through first, then the head, then the tail. Use the back end of a pencil to get into all the corners. 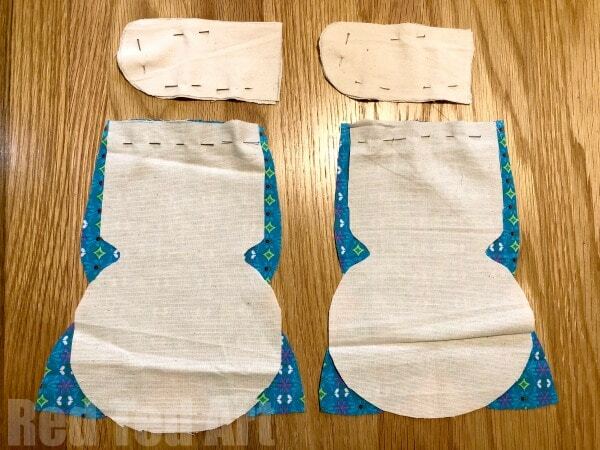 Sew the gap such using a lader stitch. 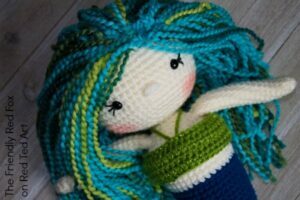 Your basic rag doll mermaid is FINISHED! Now it is time to decorate and embellish!! We decided to cut felt sea shells for the mermaid doll’s bra – but you can decorate whichever way you want. 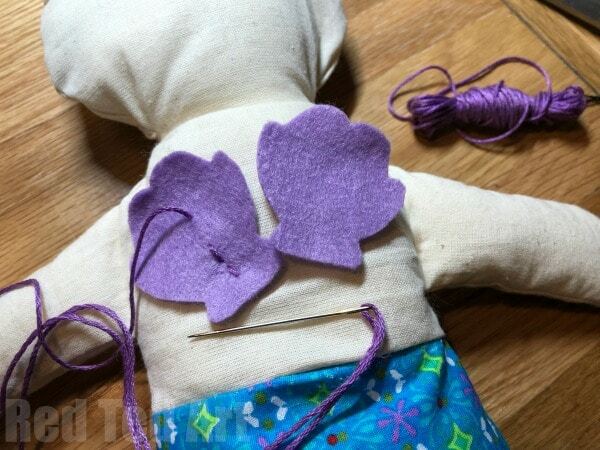 Using a back stitch I sewed the shells onto the doll – the stitch also providing with the detail on the shell. Then we sewed a ribbon around the waist – this is optional! Personally, I found this the HARDEST part of the doll! It is hard to get a rag doll’s hair right. 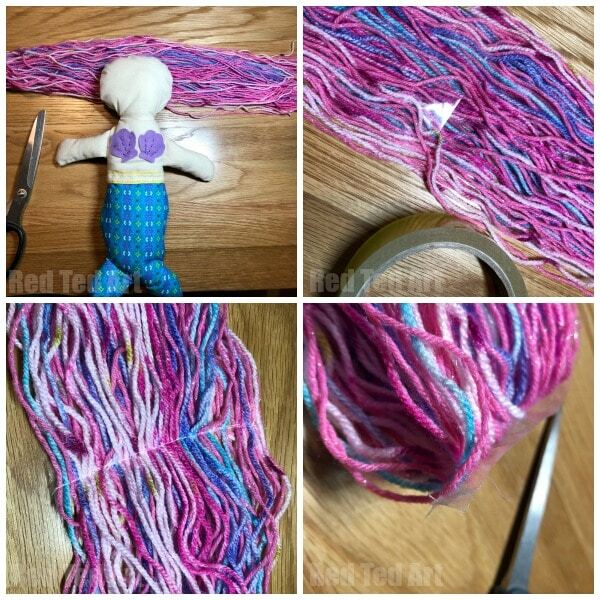 Which is why many rag dolls, have felt hair – in fact many mermaid rag doll patterns out there also have felt hair! But Pip Squeak really wanted rainbow wool hair.. so wool mermaid hair it was. We wrapped a LOT of wool around a book (I can’t say how many strands… but the images give you an idea). Cut on end. Lay flat on the table. 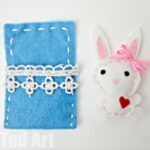 Decide where you want the part to be – a centre parting is much easier to sew (I did both.. and would only do the centre parting again). Add a line of tape over the centre parting. 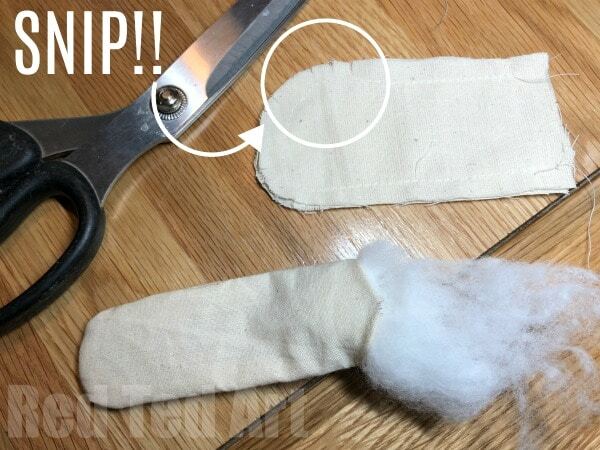 Make sure the tape is long and that you “stick it down on itself” at the ends – this gives you something to “hold” when running it through the sewing machine. Sew on the sewing machine once or twice. Carefully cut away the tape. Position the hair on the dolls head and sew in place (over the seam you created on the sewing machine) with some of the wool used for the mermaid’s hair. Bunch on the sides and tie with more wool. 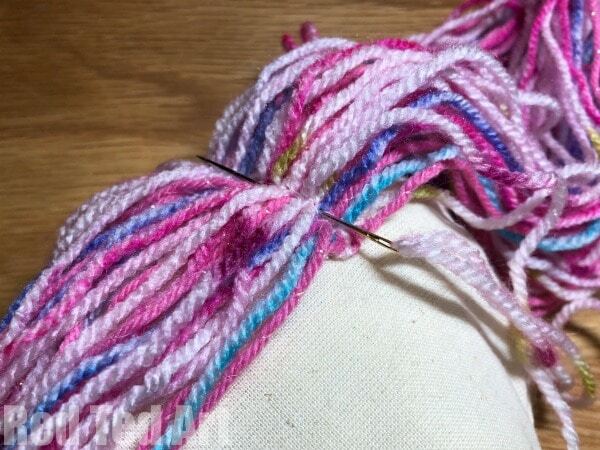 Then secure with some stitches. In principle this mermaid’s hair do sounds easy.. but in practice I found it fiddly.. but the results are oh so pretty!!! As this was Pip Squeak’s Doll, SHE got to finish it off. She is really into BIG eyes at the moment.. so our doll got big felt tip eyes. So cute. But it is totally up to you. You can also sew some facial features on with embroidery thread if you wish. 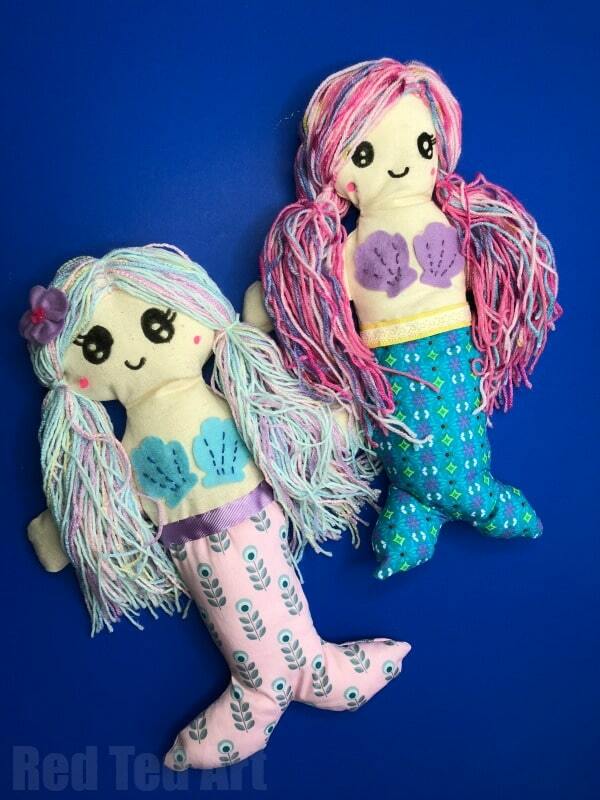 Ta da… your Mermaid Rag Doll is finished! Pip Squeak then went on to make them necklaces and bracelets and asked me to add a felt flower to the mermaid’s hair too! 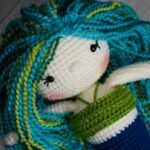 Do check out our Free Mermaid Crochet Pattern too! The link for the smaller mermaid doll isn’t working. When you click on it, it goes to another page with the word “printable 1” on it no pattern. Just to let you know the link is dead. THANKS!! Ooops! Sorry! I have fixed the link now. Thank you so much for letting me know! !